Nick Ottinger (No. 14), Brian Schoenburg (No. 7), and Michael Conti (No. 6) positioned themselves at the front of the field with a near-perfect pit strategy. 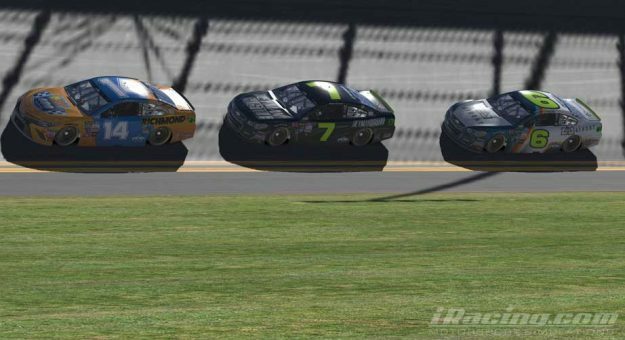 Nick Ottinger claimed victory in the opening round of the NASCAR PEAK Antifreeze iRacing Series on Tuesday night at Daytona International Speedway. The premier NASCAR online racing series features the world’s fastest drivers racing virtual Chevrolets, Toyotas and Fords on tracks all around the United States — competing for a NASCAR championship and a $10,000 prize. The race was broadcast on NASCAR.com, FansChoice.tv, iRacingLive, Facebook and YouTube. After suffering through a winless 2017, Ottinger found Victory Lane in the season opener, holding off Brian Schoenburg in a five-lap shootout. Schoenburg, who was seeking his first NASCAR PEAK Antifreeze iRacing Series win, made a bid for the victory coming off Turn 4 on the final lap, but came up short despite getting a push from Michael Conti. Schoenburg wound up .07 seconds short at the checkered flag, but was thrilled to get his season off on a positive note. Christian Challiner came from 34th on the grid to edge Conti for third. Keegan Leahy rounded out the top five after leading 13 laps. Ottinger led a race-high 40 of 100 laps and he, along with Schoenburg and Conti, used pit strategy to gain control of the race on a night where passing was more difficult than in years past. The trio, along with most of the lead-lap cars, headed to pit road for tires and fuel under caution on Lap 43. A handful of drivers, including Leahy and 2017 champion Ryan Luza opted to stay out for track position. Chris Overland (#37) and Jimmy Mullis (#11) lead the field to the first green flag. However, the next 43 laps ran without a yellow flag, forcing the drivers who stayed out to the pits earlier than the rest of the field. Some of the drivers who pitted under yellow came with the group that stayed out but needed less fuel, gaining them time. Ottinger, on the other hand, decided to stretch the run longer since he and the rest of the cars yet to pit, including Conti and Schoenburg, caught the pack exiting the pits. This allowed them to turn fast laps and keep their track position, but on Lap 86 they finally headed to the pits for a splash of fuel. Both Ottinger and Schoenburg had great pit stops, coming out nose-to-tail, well ahead of the pack. The two were able to hook up and stay in front of the field, but a caution with 10 laps to go for Casey Kirwan’s spin set up the dash to the finish. Four crashes slowed the field for 11 laps and eliminated several drivers from contention. The biggest incident occurred on the last lap in Turn 2 when the field stacked up behind the leaders. Zack Novak was the first to slide sideways and the rest of the field piled in, including Luza, polesitter Chris Overland and 2017 playoff contender Logan Clampitt. 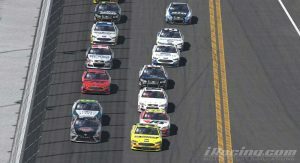 With Daytona, the only restrictor-plate race on the schedule, in the rearview mirror, the NASCAR PEAK Antifreeze iRacing Series heads to Phoenix’s IMS Raceway for Week 2 of the season. Fresh off his win, Ottinger will look to keep the momentum going in the Valley of the Sun, but Luza and three-time champion Ray Alfalla are the favorites. The pair accounted for half of the victories in the series one year ago and looks to break into the win column in 2018. Has the field closed the gap over the offseason? Find out in three weeks on iRacing Live when the NASCAR PEAK Antifreeze iRacing Series returns to action!